Scripture selection is Day 7 Period I.
for March 11th are Sorrowful. our intentions we are praying for. Help us spread the Blue Books. I give my heart to Jesus and Mary with you in love. When we communicate in my family we often use XOXO, Love, Love, Love. God loves us. Lent is really a time to stop and think about what love really is. God is the ultimate in love and He shed His Blood for us in the bitter Passion. He died for us so we could have what we have today in Baptism, the Eucharist, Confession, Confirmation, Holy Orders, Matrimony, The Anointing of the Sick. Jesus has passionate love for us and He gave Himself in the passion and His death and resurrection. The gift God gives us is on-fire-love. Life in Him in Baptism – the hope of eternal life in heaven. The Blue Books are the Mighty Medicine. Jesus’ love letters to us. The world is missing out on the Plan God wants for us. We need to spread the Word of this great love of the Heart of Jesus. I have written my love letter to Jesus and opened the Blue Book. 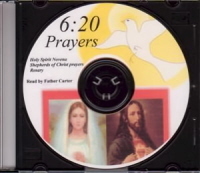 I have prayed the rosary and the Holy Spirit Novena and Shepherds of Christ Prayers. We need to go to Mass and do Adoration, adore the Blessed Sacrament, praying for grace. Really developing our love relationship with God and others, praying for the priests, the Church and the world. Mary loves us. She still appears to me. Here is her face. Mary’s image head was destroyed but I see her face. Keep this card. Use the Blue Books and know God is fighting for us and loving us and Mary is Mother at our side. God loves you and so do we. Jesus wants us to know His presence, at all times, to be one in Him. In baptism we receive a sharing in His life. The Father, Son and Holy Spirit dwell in our graced baptized soul. ...I have been crucified with Christ and yet I am alive; yet it is no longer I, but Christ living in me. 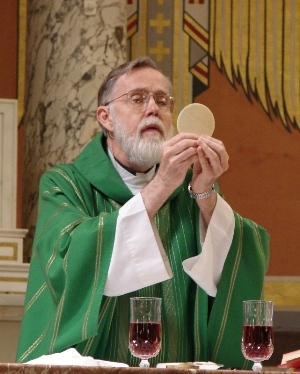 The more we go to the Eucharist, the more we are filled with His life in us. God wants us to be abundantly filled with His life in us. As St. Paul says, “it is no longer I but He who lives in me”. Open your hearts wide and let God fill you more and more with His life. On December 17, 1996, Mary's image appeared in Clearwater. This book, Blue Book 17, follows within the year after this happened. Blue Book 17 is actually October 1, 1997 – December 30, 1997. Please help us circulate these writings and begin prayer chapters all over the world praying for the priests, the Church and the world, as Jesus told Fr. Carter, S.J., our founder, in this message on the Feast of St. Ignatius. 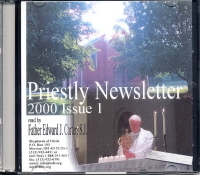 “My beloved priest-companion, I intend to use the priestly newsletter, Shepherds of Christ, and the movement, Shepherds of Christ Associates, in a powerful way for the renewal of My Church and the world. “I will use the newsletter and the chapters of Shepherds of Christ Associates as a powerful instrument for spreading devotion to My Heart and My Mother’s Heart. Thank you for all your prayers and support.